Giovanni Battista Caporali was the son of another Perugian artist, Bartolomeo Caporali. His brother, Camillo was a canon of the Duomo. He was registered in the Arte dei Pittori in 1497. Although Giovanni Battista Caporali was primarily an artist, he was also interested in the humanities. He is best remembered for his translation into Italian of the first five of the ten books of “Architettura” by the Roman Vitruvius in 1536, first editions of which still circulate. ✴In the commentary of his translation of Vitruvius, he referred to Perugino as “among my other tutors” (my translation). Giorgio Vasari referred to him as a disciple of Perugino, and the Capra Altarpiece (ca. 1505), which came from Perugino’s workshop, seems to have been largely by his hand (see below). ✴He was documented as an associate of Pintoricchio in the execution of the altarpiece (1502-5) of the Coronation of the Virgin for Santa Maria della Fratta, Umbertide (see below). Pintoricchio appointed him as his agent in Perugia in 1507. ✴Pintoricchio was presumably in Rome in relation to another of the projects of Julius II, the decoration of the vaults of the choir of Santa Maria del Popolo (completed in 1510). Scholars have suggested that Giovanni Battista Caporali was still working closely with Pintoricchio, and that his hand can be identified in the frescoes of the vaults of the choir of Santa Maria del Popolo. The earliest major work that is attributed to the independent Giovanni Battista Caporali is the San Girolamo Altarpiece (ca. 1510) in the high altar of San Girolamo, Perugia (see below), a work in which he seems to have responded to the new age of Raphael. His interest in music is represented here in the sheet music placed on the step of the throne. He was commissioned to take over the decoration of the Cappella Vibi in San Pietro, Perugia in 1521: this fresco cycle is badly damaged, but what remains indicates that it was one of the most erudite compositions of its time in the city. Giovanni Battista Caporali’s interest in architecture seems to have started with his meeting with Bramante in Rome in 1508 and culminated in his translation of Vitruvius, discussed above. In between, he designed the Palazzone, Cortona for Cardinal Silvio Passerini in ca. 1520. He also played a central role in the execution of its frescoes in the period 1521‑29, the years in which Passerini acted as papal legate to Perugia and the Duchy of Spoleto. According to Giorgio Vasari, Tommaso Bernabei, il Papacello was among those who worked under Giovanni Battista Caporali on the frescoes of the Palazzone. In 1540, the two men contracted to “correct” a work in Santa Maria Assunta, Cesi by il Papacello, for which payment was still outstanding. This was probably a fresco (ca. 1538) on the left wall, a fragment of which, depicting the Madonna and Child, was detached in 1922 and moved to its current location, in a room off the sacristy. A large number of documents survive that relate to works that Giovanni Battista Caporali executed in Perugia in the last twenty five years of his life. However, only one of these works survives: the fresco (1532) of God the Father and Evangelists on the ceiling of Santa Maria della Luce (see below). This altarpiece, which is attributed to Giovanni Battista Caporali, was recorded on the high altar of San Girolamo in the 17th century. Agostino Tofanelli, the director of the Musei Capitolini selected it for dispatch to Rome in 1811, probably on the basis of an attribution to Perugino. It was subsequently decided that it should remain in the church. It was moved to the back wall of the apse in 1822 and entered the Galleria Nazionale in 1863. The altarpiece depicts the Madonna and Child enthroned, with two flying angels and the heads of three cherubs above. The scene is set in a landscape, with SS Francis and John the Baptist to the left and SS Jerome and Antony of Padua to the right. The structure of the throne and the figure of St John the Baptist derive from Raphael’s Ansidei Altarpiece (1505), which was then in San Fiorenzo, Perugia. The document on the steps below the throne contains the clearly written lyrics of a popular Marian hymn, together with the accompanying music, set in four parts. This damaged fresco on the facade of Santa Maria della Misericordia is attributed to Giovanni Battista Caporali. 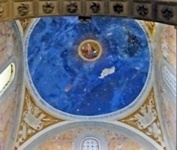 Giovanni Battista Caporali was commissioned to execute the (now very damaged) frescoes in the Cappella Vibi, San Pietro. (He originally executed the frescoes of the adjacent Cappella Ranieri in 1529, but these were subsequently over-painted). This fresco by Giovanni Battista Caporali, which depicts God the Father and the Evangelists, is on the ceiling of Santa Maria della Luce. It was beautifully restored in 1978, at which point the date inscribed on one of the scrolls held by angels was revealed. The other detached frescoes are in the deposit of the gallery. This fresco in San Salvatore, Cereseto, a village near Panicale is attributed to Giovanni Battista Caporali. It depicts Christ Enthroned with SS Peter and John the Baptist. ✴The main panel, which is illustrated in this website on the church, depicts the Holy family and the shepherds around the baby Jesus, who lies in a field. St Michael in armour kneels behind the baby, at the centre of the composition. ✴The panel in the lunette depicts Christ blessing, with angels. ✴The predella has been lost. Giorgio Vasari reported that Perugino painted this altarpiece for Benedetto "Calera" in the Cappella di San Nicolò da Tolentino of Sant' Agostino. In fact, Vasari had misread the name in the (now lost) inscription, which later writers record as “Benedictus di Benedictis cognomine Capra". There was also a second inscription on the now-lost predella that referred to the donor as “Philippus Capra Benedicti”, the son of the celebrated jurist, and gave the date 1471. ✴his son (i.e. the jurist’s great grandson) was also called Filippo. It must have been this second Filippo di Benedetto who commissioned the altarpiece. Pietro Scarpellini attributed the work largely to Giovanni Battista Caporali (as referenced in the page on this artist), albeit that “Pietro [Perugino] intervened at the last moment to put his imprint on a work that came from his workshop” (my translation). ✴The main panel, which depicts the Madonna and Child with SS Jerome and Augustine, was sent from Paris to Bordeaux in 1803. It is now in the Musée des Beaux-Arts, Bordeaux. ✴Two predella panels depicting miracles of St Nicholas of Tolentino, which might have belonged to this altarpiece or alternatively to that of the Coronation of St Nicholas of Tolentino by Raphael, found their way into the collection of Ralph Harman Booth (died 1931). His widow gave them to the Institute of Arts, Detroit, and they are illustrated in the institute's website. ✴Camillo Caporali received 40 scudi in October 1505 on behalf of Pintoricchio and Giovanni Battista Caporali. This latter payment suggests that Giovanni Battista Caporali was involved in the execution of the altarpiece, at least in the later stages. ✴below, the Apostles and, in front of them, five kneeling Franciscan saints: SS Bernardino of Siena; Bonaventure; Francis; Louis of Toulouse; and Antony of Padua. This fresco in a niche in the left wall of Sant’ Agostino depicts the Madonna (holding her girdle) and Child with SS James and John the Evangelist. The inscription records that Gregoria de Malapelle commissioned the chapel (and presumably the fresco) in 1522. Pietro Scarpellini (referenced below) attributed the fresco to Giovanni Battista Caporali. The throne refers directly to that in the San Girolamo Altarpiece (ca. 1510) from San Girolamo, Perugia, which is similarly attributed to him (see above).